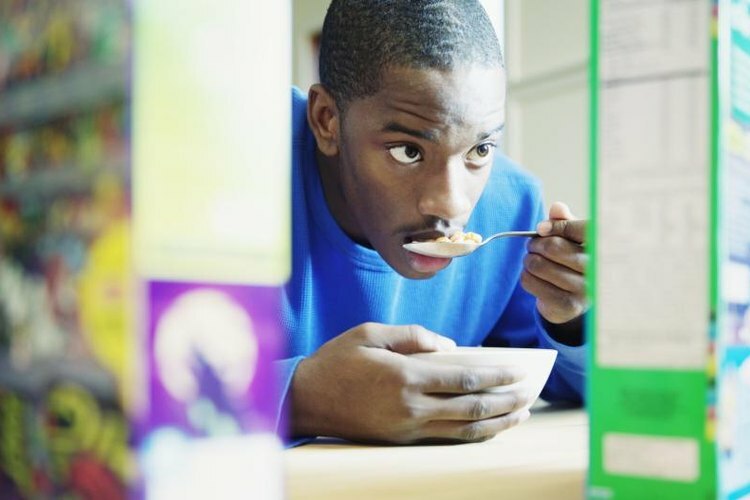 A man looks at the cereal box while he eats. The Wheaties cereal box has been graced with American athletes since 1934, when baseball great Lou Gehrig was bestowed the honor. Over the years, esteemed athletes such as Bruce Jenner, Mary Lou Retton, Michael Jordan, Chris Evert and Andre Agassi have had their turns promoting the breakfast cereal. You too can have your photo featured on the front of a Wheaties box, even if you’ve not won Olympic gold or been a superstar athlete. For a small fee, General Mills, the manufacturer of Wheaties, has made it possible to personalize a box of Wheaties for a small fee. At Wheaties.com, after you create an account, you can upload a digital photo of yourself or a loved one. It will be printed on a box of cereal and mailed directly to you. The photo can be of your choice and may include a simple head shot, for example, or an action shot taken while playing your favorite sport. Based on the west coast, Beth Rifkin specializes in business, food, cooking, family, lifestyle and health issues. Her work has appeared in numerous on and offline publications. Beth earned a Bachelor of Business Administration from Temple University.